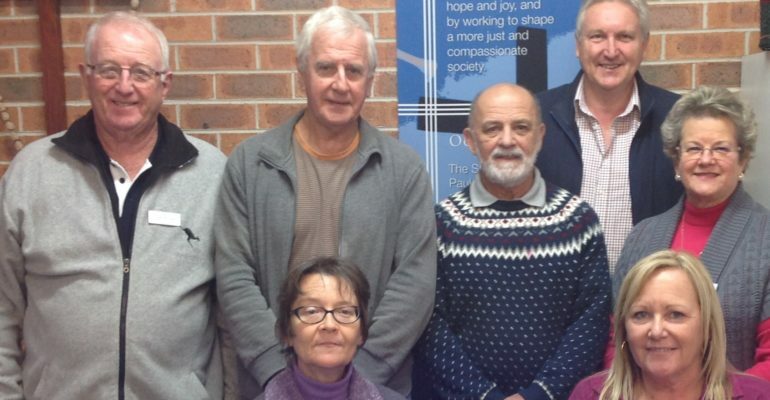 Rear left to right: John Meehan OAM, John Dening, Bill Caruana, Mick Winner, (conference presidents Wollongong Region, Gaynor Mason Wollongong Diocesan Central Council President, Seated left: Teresa Harm Deputy Executive Officer and Tracey Johnston Financial Controller Diocesan Office Manager. Within a few months of commencing as Wollongong Central Council President, Gaynor Mason and her colleagues on the Council identified a need to improve the way Conference Presidents were welcomed and supported in their roles. Gaynor and Rhonda Maher (Central Illawarra Regional President) met with Teresa Harm to review their orientation process. Because twelve new Conference Presidents had been elected in the last six months it seemed timely to pilot a new orientation program across three regions. Content was drawn from the new “Unlocking Leadership” Resource Kit developed by the Policy & Member and Volunteer Services at the State Support Office and the National Council Roles and Responsibilities for Conference Presidents. Group sessions were run locally for the Presidents and for those unable to attend the group sessions, Teresa Harm ran a one-on-one session. Participants said they appreciated the opportunity to meet with other Conference Presidents so they could learn about other ways of working. They also enjoyed meeting Central Council staff, including Sherie Avalos, Executive Officer, Teresa Harm, Deputy Executive Officer (and facilitator) and Tracey Johnston, Financial Controller/ Diocesan Office Manager. Most agreed that they will visit the Central Council office to learn more about how the staff are able assist Vincentians in their Conference work. This program was a pilot and the feedback will inform the improvements to the orientation and the requests for more learning will be actioned in the coming year. Thanks to Teresa Harm, Deputy Executive Officer of Wollongong Diocesan Central Council for this story and the photo.